I love seeing what people keep in their bag! I can't be the only one, right? It's interesting to see what people value - or sometimes forget that they have in their bag! 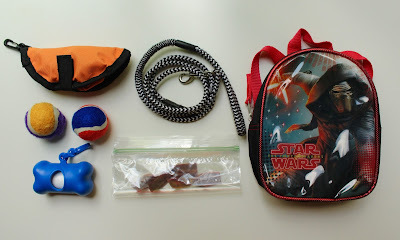 Well, my little Milo recently got his own bag and I thought it would be fun to show you what he usually keeps in there. 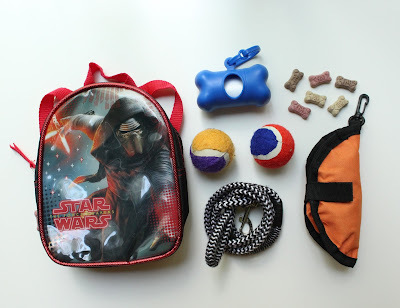 Treats, toys and poop bags. Pretty much the most important things in his life. 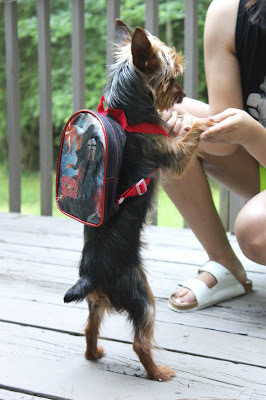 We just got his backpack at Target. Now I'm slightly obsessed with the Target Dollar Spot. I can spend quite a bit of time just going through their cute items. Aaaand I'm pretty sure I'm not alone here! They usually have adorable clothing and accessories for dogs as well. They range from $3-$5 so its quite a steal! I found his mini backpack a few weeks ago. 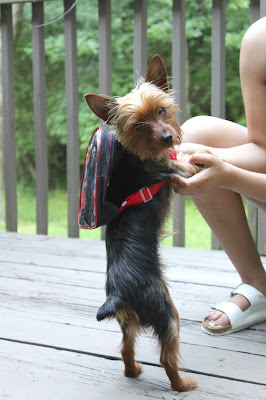 Now I know its not for pets but it was the perfect size for Milo. The Star Wars one was a no brainer because Milo is huge fan! I mean we're obviously assuming here... ha! He does look pretty great! I mean that booty though! He now holds his own little items. And it doesn't hurt that he is stylish at the same time! We were just at Target today and they still have them! Lots of different colors and characters too! What's in your pup's bag? #DiningInDurham with Andie - 4 New Updates!